Calexico is no stranger to negotiating borders. For the better part of two decades, eight albums, and countless trips around the globe, Joey Burns and John Convertino have crossed musical barriers with their band, embracing a multitude of diverse styles, variety in instrumentation, and well-cultivated signature sounds. Under fences it digs and over mountains it climbs, sometimes into untrodden terrain, sometimes towards a more familiar landscape, and sometimes simply walking that fine line to soak up sustenance from all sides. These are men from the desert, yes, but there has always been so much more to Calexico than just heritage and heat. Their latest album Edge of the Sun sees Burns and Convertino straddling that celestial division of light and dark, taking inspiration from a trip to a place surprisingly unexplored by the band before, and with the benefit of many friends and comrades to help guide the way.“When I step back from this record I see the spirit of collaboration,” says Burns. “As we began working on it, we started inviting people and it was a natural thing. We’ve always welcomed guests; it’s in our DNA. John and I are really good at hopping in to play with people and improvise but we’re also sensitive to what artists need.” “We’ve collaborated a lot in the past on other records but this one is the most vastly collaborative,” says Convertino. “Almost every song has a different guest.” The first outside invitation came when Burns was writing “Bullets and Rocks” and recognized space for a former Calexico collaborator to join. “When putting vocals on that song, it immediately reminded me of the Iron & Wine feel,” says Burns. “So I texted Sam (Beam), who wrote back quickly and got it going.” Encouraged by that experience, the guest list grew to include musicians from a myriad of backgrounds, origins, and genres, including Ben Bridwell from Band of Horses, Nick Urata from Devotchka, Carla Morrison, Gaby Moreno, Amparo Sanchez, multi-instrumentalists from the Greek band Takim, as well as Neko Case. Burns’ older brother John Burns lent a hand to some lyrics and songwriting, and the band’s keyboardist, Sergio Mendoza, stepped up to co-write and arrange certain songs, ultimately co-producing the album along with Burns, Convertino, and longtime associate Craig Schumacher. 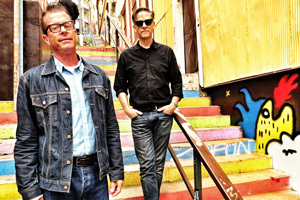 Negotiating borders and the spaces within, then inviting others inside those edges: that may be the recipe for Calexico’s success. As its empire expands and the familiar pieces join with fresh ideas and a new cohort to pass under wires and across fields and time, Calexico now finds itself here in 2015 on the solar precipice, navigating the edge and trying to find hope in that balance of darkness and light. “The ‘edge of the sun’ could be coming from the direction of darkness seeking light, or riding the line between both,” says Burns. “Which side of this edge are you on?